The Kitschies, sponsored by Blackwell’s, is one of the UK’s finest literary awards, with previous winners such as Margaret Atwood, Maurice Broaddus, N. K Jemisin, Adam Roberts, Emily Carroll and Tade Thompson taking home either a red, gold or inky tentacle plushie and cash prize. 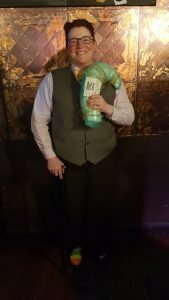 The Golden Tentacle is awarded to a debut novel that ‘best fits the criteria of progressive, intelligent and entertaining’. Hob Ravani’s problems start before her Uncle is killed. But they don’t end there. Hob lives, not in a Company Town, but on a Company World. TransRift own the planet and everyone on it. But not everyone on the planet got the memo. And not everyone on the planet is fully human. 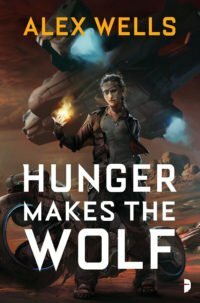 Alex Wells’ debut is the solution to an equation that seemed unsolvable; how to do a space western without endlessly, and damagingly, invoking Firefly. The solution Alex finds is simple, and brilliant. To create a space western that has such a strong voice that the comparison is vanishing by the time you’ve arrived at the end of the first paragraph. As you’re transported into the arid wastes of Hob Ravani’s life, Alex shows you a world which is historically familiar but in practice, unique. The secrets and lies of small towns still work light years from home and as the story goes on, Alex uses that to harness the themes of the novel together. Hob’s family, Hob’s chosen family, Hob’s world and what’s being done to it all orbiting one another in a close-in, at times brutal war for dominance. One that, as Alex reveals the true strangeness of the world, becomes all the more desperate. 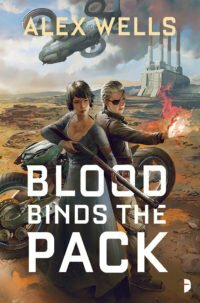 This is action packed, character driven science fiction that’s also intricately designed and powered not by the empty spectacle of space cowboys but by the complex needs of chosen family and who you’ll stand for and fall with. 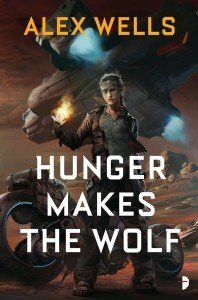 As a bonus for you Robot Army, and to celebrate the win, we’re offering ebook copies of Hunger Makes the Wolf for just £1.99 (or equivalent) on the website today. Just click here to grab your copy! And make sure to congratulate Alex (@katsudonburi) on the news!